As far back as I can remember, I’ve had a penchant for the bittersweet, or maybe just bitter… My favorite childhood flavor of Friendly’s ice cream was Forbidden Chocolate, which no other 8 year old around me could tolerate. In college a nice French boy gave me a bar of Cote D’or 86% Noir Brut (literally translated, raw black) and I became obsessed. Lately I’ve been popping cacao nibs like M&M’s. Sadly, I’ve outgrown Forbidden Chocolate, so when Liz sent me Ina Garten’s recipe for deeply chocolate gelato calling for an entire cup of cocoa powder, I was sold. My cocoa powder supply is depleted, there is chocolate on my nose, all over my white sweater, smudged on my elbow (how? ), and I’m positive I’ll find chocolate goop in my hair later. 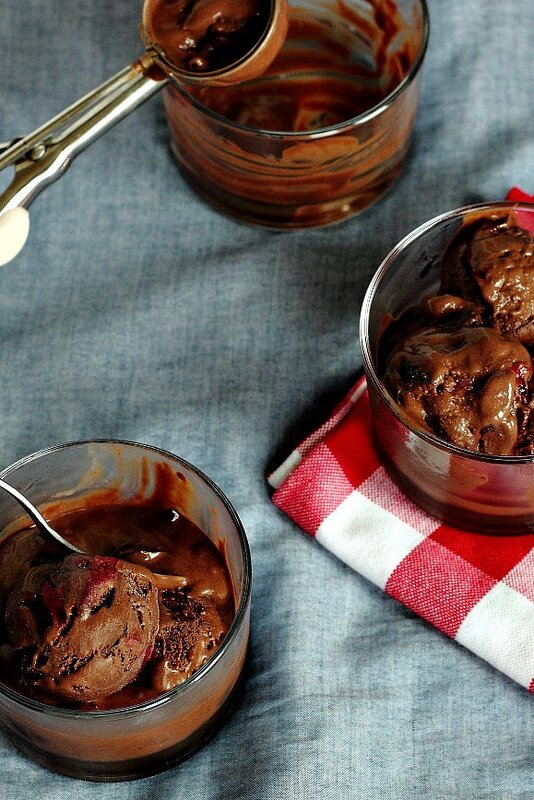 You should only make this ice cream if you’re a dark chocolate freak too, though even then, you could easily reduce the cocoa powder content to half a cup, and it would still be like midnight. It tastes like an 80% bar in ice cream form, with a dry finish. At first it was so intense Liz fell over after taking her first bite, but day by day, it grew on her, much like black coffee or strong whiskey. “I ate some last night, and it was great,” she texted this morning. I, on the other hand, have been letting it melt until it’s like soft serve, then shoveling it into my mouth for breakfast. Three hours later, the taste still lingers, and I want more. A gallon would be nice. I added fresh cherries, which I pitted without a cherry pitter. I tried the paper clip trick, which, for the record, did not work. I tried using a straw, as suggested by Lifehacker, and only managed to squirt cherry juice all over my shirt (maybe it’s time to invest in an apron?). Finally I just used a paring knife and sliced around the pit, which was surprisingly quick and easy. 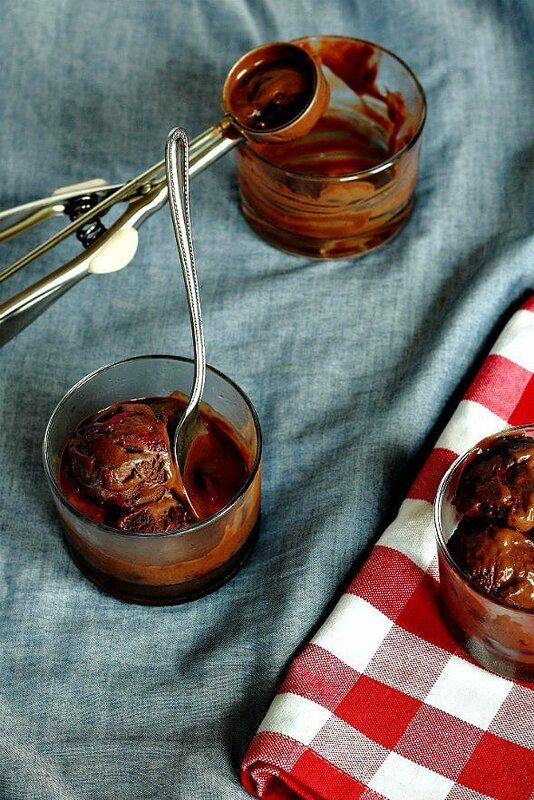 The tartness of cherries brightens up the intensity of the chocolate, but is completely optional. 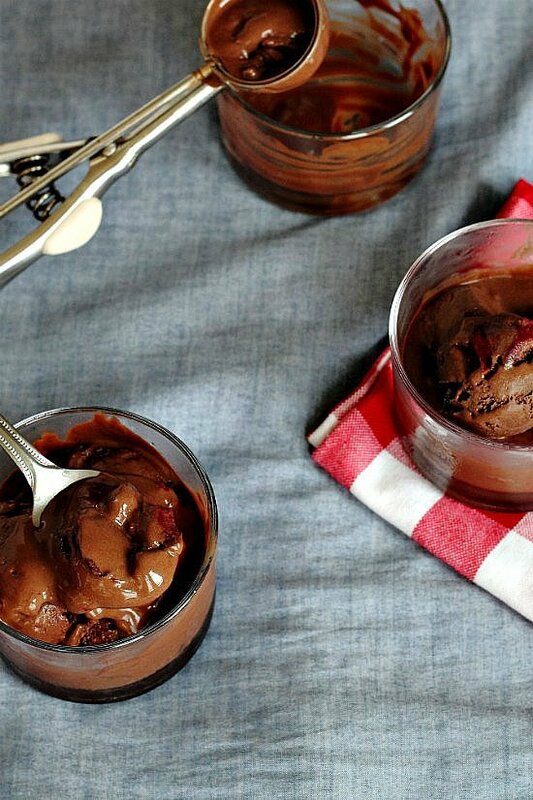 Is the hunt over for the best dark chocolate ice cream in the world? Not yet! It might cost me a small fortune, but the recipe testing will continue all summaaaa longgg. Beat egg yolks in a pot, then add milk, cream, and sugar. 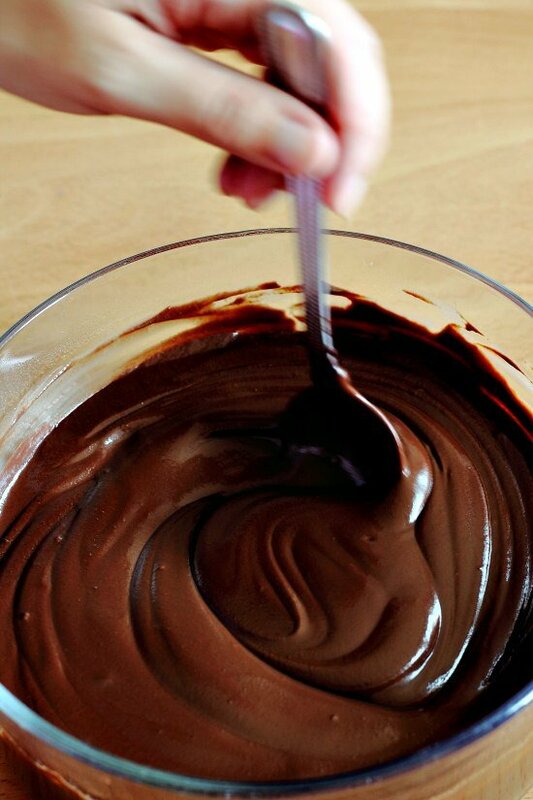 Bring it to a simmer, remove from heat, add the cocoa powder and chocolate, and whisk until smooth. Add the cherries and cook over medium heat, whisking constantly, until the mixture thickens into a pudding-like consistency. This may take several minutes but the thickening will happen quickly towards the end. Do not let the mixture boil. Remove from heat and stir in the liqueur, vanilla extract, and salt. Transfer the mixture to a mixing bowl, cover with plastic wrap, and set the mixing bowl over an ice bath, then refrigerate until fully chilled. Churn the custard in an ice cream maker. Eat as soft serve or freeze in a covered container. Once fully frozen, thaw the ice cream for 20 minutes at room temperature before scooping. 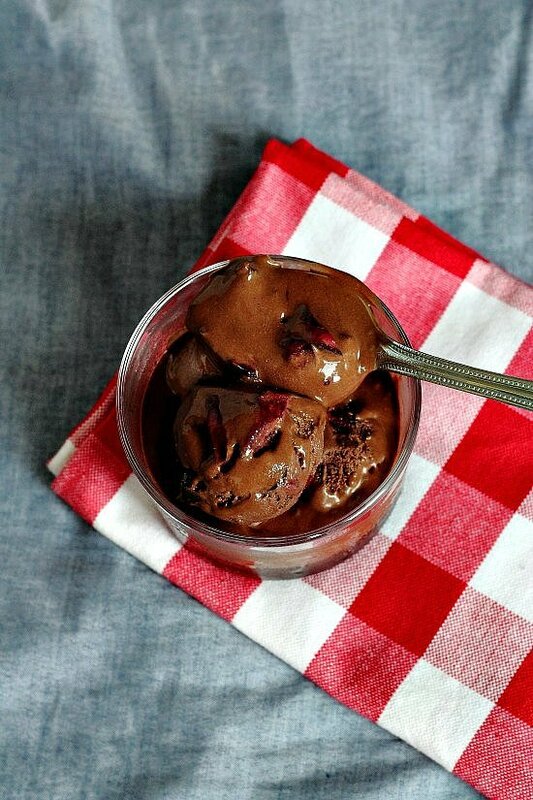 Was craving deep dark chocolate ice cream so I’m about to make some soon! P.S. I pitted a whole jar of morello cherries quite quickly by using a plier to bend the tips of the two middle tines of a fork in and used to pull the pits out! My custard is in the freezer now! Will it turn out ok if my custard isn’t as thick and pudding-like as shown in the pic? It was thick such that it coated the back of a spoon but was not runny, more gooey. What do you reckon? Yep, gooey is the texture you want. Did you churn it in an ice cream maker? It should be good to go if you did. When you take it out of the freezer let it sit for 5 minutes before trying to scoop it out. Hope you like! I’m new to the world of making your own ice cream so I’m wondering is there a substitute for heavy cream? Ohhh, that’s what I tried to do with a straw! But the straw kept bending. I’ll try it with a chopstick as soon as I get my next bag of cherries. I happen to have an empty wine bottle on hand 🙂 Thanks for the link! Ohhh this looks absolutely marvelous. I definitely preferred milk chocolate to dark as a child, but now it’s the opposite (not sure exactly when that shift occurred…) – I’m practically salivating right now. Before I bought a cherry pitter, I had success with the paper clip trick, but that was with tart cherries – I wonder if that makes a difference? Regardless of the method, yes…cherry juice evvvverywhere. Ohhh maybe I need a bigger paper clip! The sweet cherries I had were pretty gigantic. I think tart cherries are a bit smaller? I should probably just invest in a cherry pitter hehe.